Phase I Completion of 3D Printed Luna Park- Reception and Party This Sunday! 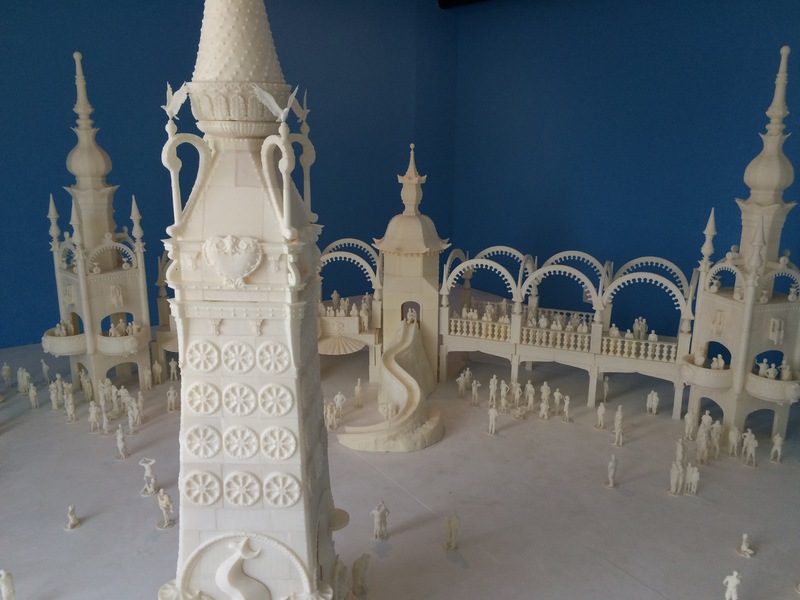 Thompson & Dundy’s Luna Park: 3D Printed in Coney Island! Brooklyn, NY. August 4, 2015 – Coney Island USA is pleased to announce the Phase I completion of the world’s largest art installation ever created with desktop 3D printer technology at the Coney Island Museum. Thompson & Dundy’s Luna Park: 3D Printed by the Great Fredini is an installation by artist Fred Kahl recreating the ornate art and architecture of Coney island’s heyday 100 years ago. Over two years in the making, Kahl has been 3D printing a scale model of historic Luna Park and expanding the piece, including scanning and 3D printing hundreds of supporters and Coney Island Characters to be featured in the tableau. To celebrate the completion of the project’s Phase I, an artist’s reception will be held on Sunday, August 16 from 3-5pm, followed by a presentation on the project at 5pm. Brooklyn-based artist and impresario Fred Kahl, a.k.a. the Great Fredini has a goal, to fully 3D model and fabricate a 1:13 scale 3D-printed replica of Coney Island’s famed Luna Park as it stood a hundred years ago, and populate it with portraits of Coney Island’s most interesting characters from his Scan-A-Rama 3D Portrait studio. With the model’s central Electric Tower almost 7’ tall, this is no small task. Kahl has pushed the possibilities of desktop 3D printing to its limits and even invented his own 3D scanning rig to capture images of the exhibit’s denizens. The project garnered worldwide attention in the summer of 2013, when Kahl raised over $16,000 on Kickstarter to build a “bot farm” in support of the endeavor. Two years later, he has 3D scanned thousands of backers as well as Coney’s visitors who are featured in the installation along with the iconic central towers of Luna Park that were painstaking modeled based on archival images. Kahl hopes to soon begin a second phase of construction on the project, including the park’s entrance and feature attractions including the Trip to the Moon ride, Mountain Torrent, Japanese Tea Gardens, 20,000 Leagues Under the Sea, Dragon’s Gorge, Wormwood’s Monkey Theatre, Red Mill and Chute the Chutes. The completed model is estimated to be approximately 1250 square feet, significantly larger than the current 250 feet it currently occupies , so Kahl hopes he will be able to find a new venue to bring it to as the exhibit outgrows the space in the Coney Island Museum. A graduate of New York University’s Interactive Telecommunications Program, Kahl was an award winning creative director before creating his own startup Fredini Enterprises, Inc. He envisions it as a content studio for 3D printed and digitally shared files. Kahl has been obsessed with 3D printing for several years and even created his own open source hardware for creating full body 3D scans using an Xbox Kinect game controller to capture the 3D image of his subjects. The invention has been featured in Make Magazine and on CNN, and used by hundreds of people worldwide, including by Shapeways. His Scan-A-Rama 3D portrait studio is the current resident of Coney Island USA’s Artist Incubator program and has become a staple of today’s cultural landscape in Coney Island. Artist Reception Sunday, August 16, 2015, 3-6pm with a 5pm presentation. Free with $5 Coney Island Museum Admission. About Coney Island USA: Coney Island USA is a 501(c)(3) not-for-profit corporation based in the amusement park area of the Coney Island neighborhood of Brooklyn, New York. In existence since 1980, Coney Island USA has developed and produces a number of different programs including some of New York City’s best-loved summer programming, such as the Mermaid Parade, the Coney Island Circus Sideshow, the Coney Island Museum, Burlesque at the Beach and the Coney Island Film Festival.